Latvia in general can be characterized as an agricultural country, having great potential in developing sustainable farming and living according to principles of permaculture. Lately we have started to pay more attention to individual farmers working at home and contributing to economic growth of the country. Project on sustainable gardening and exchange of experience in gardening matters. Project partners from different countries have come to the first project meeting at Dobele PIUAC, the director of the centre Brigita Tivča outlined the main aims and activities of the project. The project will focus on promoting sustainable gardening issues, pay attention to the ways gardening is carried out - environmentaly friendly gardening, thus improving people`s wellfare. 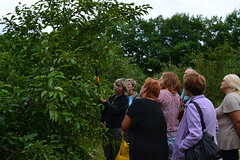 From my first meeting in Latvia what I can take home and work out with our gardening groups is the happiness about open the private garden and sharing and tasting with others the results. I'm sure it would be a good experience to brake barriers among participants.